Salmon farming is the industrial production of salmon where thousands of salmon are contained in cages suspended in the sea. The Galway Bay environment is at serious risk from the proposed industrial salmon farm development. In particular, the size of project is to be noted. The cage systems would cover some 456 hectares. At the projected prouction of 15000 tonnes per annum, this fish farm would be larger than the aggregation of all salmon farms around Ireland. Furthermore, it is envisaged that this would be Europe’s largest salmon farm. It is considered that Galway Bay does not have the capacity to assimilate abnormal quantities of pollution arising from the combined accumulation of fish excreta, associated applied medications, antibiotics and waste food. Such accumulations would have the potential to seriously amplify the effects of harmful algal blooms that killed marine life in 2005 and again in 2012. These incidents are both increasing in frequency and in intensity. Local inshore fishermen are of the strong opinion that such an accumulation of pollution would seriously harm their livelihoods. 500 new jobs are claimed. ( 150 directly employed and 350 in associated industries ) This claim is debunked by many authoritative voices not least because the job potential will be the ultimate remit of whatever multinational aquaculture operator acquires the license and furthermore this is a most ambitious claim for what is an increasingly mechanized industry. There is a profound risk of major job displacement. This specifically relates to the thriving inshore fishery within the bay and the internationally famed oyster fishery. An export driven, sustainable prawn, lobster and crab fishery has existed for many years. Other sectors at risk are the general tourism industry, the specialized sector of eco-tourism and the famed game angling attraction. BIM, who will issue the license for the farm commissioned themselves to carry out the EIA which they are using to make recommendations to Minister Coveney. They utilized the resources and expertise of the Marine Institute to deliver certain aspects of the EIA. Both have the same masters. Both are government bodies. Minister Coveney is the political master of both and has been a vocal supporter of the farm both in public and in private since this project was proposed. 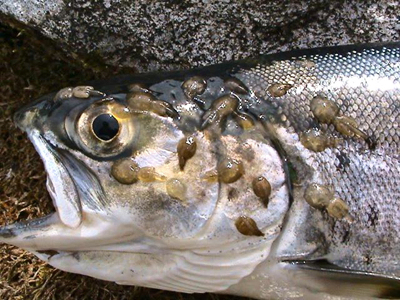 Salmon farms cause a population explosion of sea-lice. This explosion in sea-lice population kills up to 38% of migrating sea trout and salmon smolts from nearby wild fisheries. It takes some 2 to 3 kilos of wild fish feed to grow 1 kilo of farmed salmon. It is the case that we can no longer supply the needs of the salmon aquaculture industry from the North Atlantic fisheries and so the Southern oceans are being denuded on an industrial scale of their biomass to meet the demands of the salmon aquaculture business. There are no discernible environmental benefits to either Galway Bay or its community arising from the implementing of such a proposed super-sized industrial salmon farm project as that outlined by BIM. Indeed, the proposal is considered to be a massive experiment based on dubious science. The consequences of such, potentially, being that of substantial environmental degradation, harmed tourism and reduced local employment. The licence rules for Irish salmon farms were changed in 2015, after the Galway Bay application. Instead of production tonnage, future licences will be issued using SSB “Standing Stock Biomass”, and farms will be limited to 5-7,000 tonnes SSB. However, this appears to be a way of manipulating numbers to make farms appear smaller, when in fact they are very large production units. SSB is the tonnage of fish on a farm at any given time. It is considerably lower than what the annual production would be, as fish are constantly growing and being harvested. A farm of 7,000t SSB could easily amount to 15,000t annual production. So applications will be for seemingly “small” tonnage farms, but in reality applications will be for monster-sized units like the Galway Bay project would have been. I speak with tourists from many countries in the course of my day to day work here in Fanore. The cleanliness and unspoiled beauty of the area seem to be the elements of this area that are most commented upon. An interesting item of note is that many visiting anglers seem to be more appreciative of the cleanliness of the sea and the unspoilt views than the actual catching of fish! It is my firm feeling that any form of industrialisation of the bay would have a negative effect on tourism. The mere concept of a large fish farm being located here has already caused considerable consternation amongst visitors and anglers alike. Mick O’Toole: Craggagh (Fanore) Post Master and angling advisor. I have, since boyhood, enjoyed the harvest of Galway Bay. The quantity of fish that I catch has fallen, probably due to ‘factory type’ fishing out in the deep sea. It is the case, however, that there are plenty of crabs, lobsters, prawns and mussels to be won from the clear waters of the bay. I am fearful that, should a major fish farm be sited within the bay, these natural foods may be degraded or poisoned. It is my understanding that medicines and antibiotics would be introduced into the fish farms. There is surely a risk that such chemicals may pollute or spoil the sea water. I look at the damage that over fertilisation has done to some of our fields and think that similar could happen to the sea. The coach people that visit the farm see our unspoiled sea and land. It is for that reason that they come here. I don’t think that they would like to know about these salmon cages ! Martin Driscoll: Alpaca farmer and crab collector, Murrough.